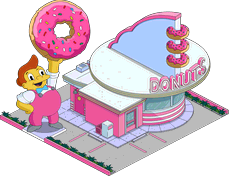 The Simpsons: Tapped Out 4th of July 2017 content update is a secondary update of the Time Traveling Toaster, Road to Riches, Donut Day 2017 and 4th of July 2017 update and was released on June 28th, 2017. The update ends on July 5th, 2017. 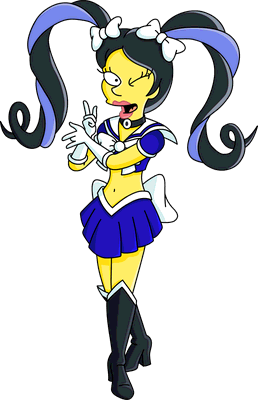 It added a new decoration-character combo. 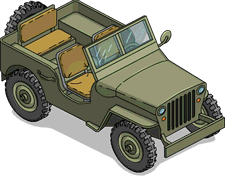 Dwight D. Eisenhower Unlocks with Eisenhower's 4x4. 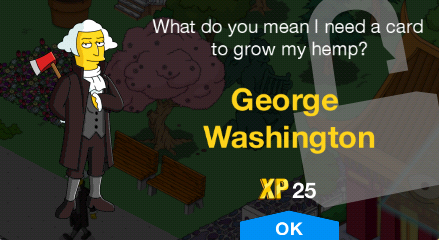 George Washington Unlocks with Ye Olde Cherry Tree. Returns from July 4th 2014, 4th of July 2015 and 4th of July 2016. 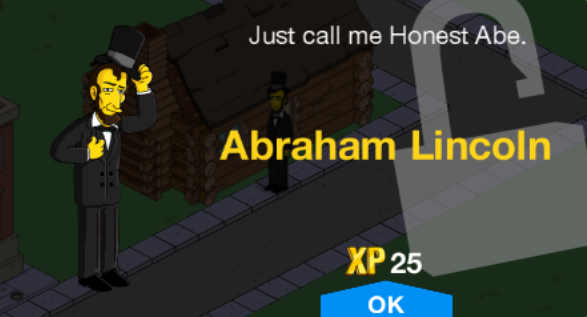 Abraham Lincoln Unlocks with Lincoln's Cabin. Returns from 4th July 2013, Valentine's Day 2014, July 4th 2014, 4th of July 2015 and 4th of July 2016. 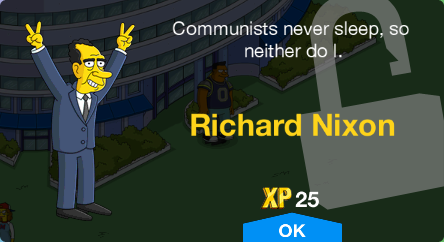 Richard Nixon Unlocks with Scandal-gate Hotel. Returns from 4th of July 2015 and 4th of July 2016. 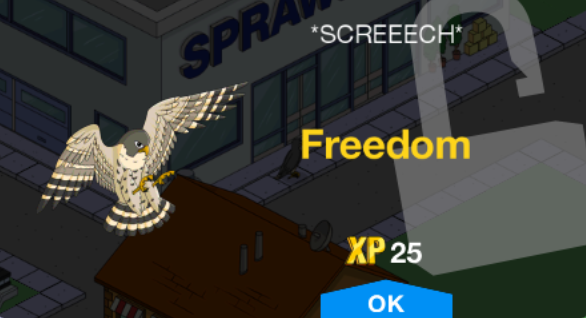 Freedom Possible 4th of July Mystery Box item. 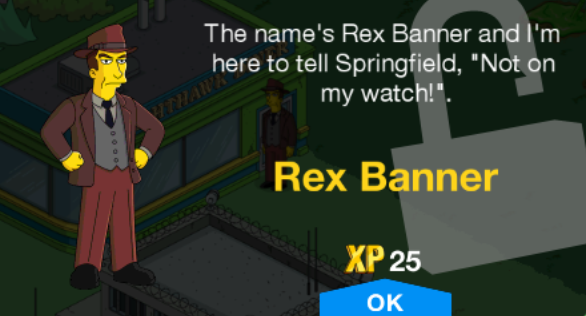 Also unlocks with Presidential Estate. Returns from "Diggs" and "The Man Who Grew Too Much" episode tie-in and 4th of July 2016. 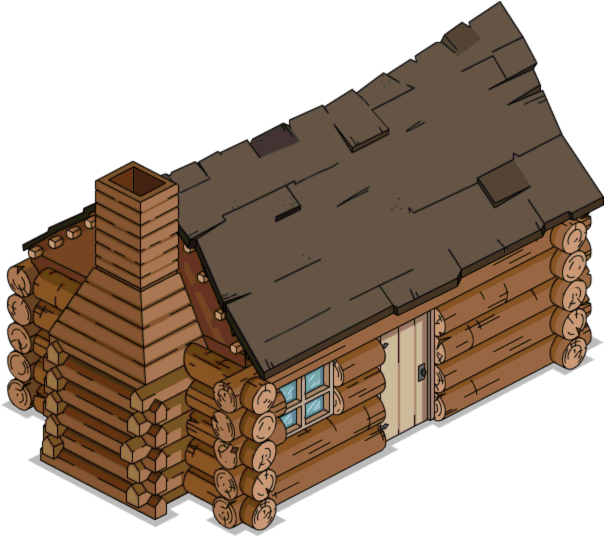 Teddy Roosevelt Unlocks with Springfield National Park. Returns from 4th of July 2016. Laird Ladd Unlocks with Retro Lard Lad. 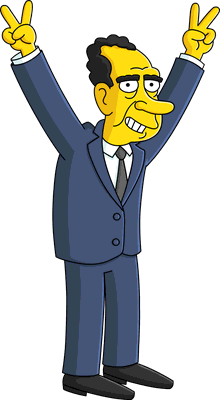 Returns from Season Premiere 2016 "Monty Burns' Fleeing Circus" episode tie-in. All-American Apu 30 Returns from 4th July 2013, July 4th 2014, 4th of July 2015 and 4th of July 2016. 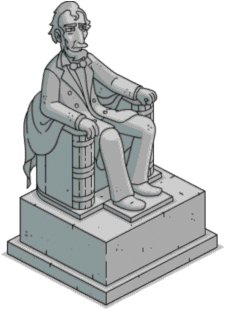 Lincoln's Cabin 6s Income Tax Possible 4th of July Mystery Box item. 4th of July 2015 and 4th of July 2016. 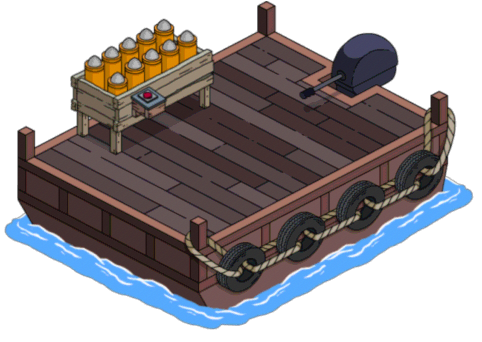 Scandal-gate Hotel Taking Reports of Concerned Guests Possible 4th of July Mystery Box item. 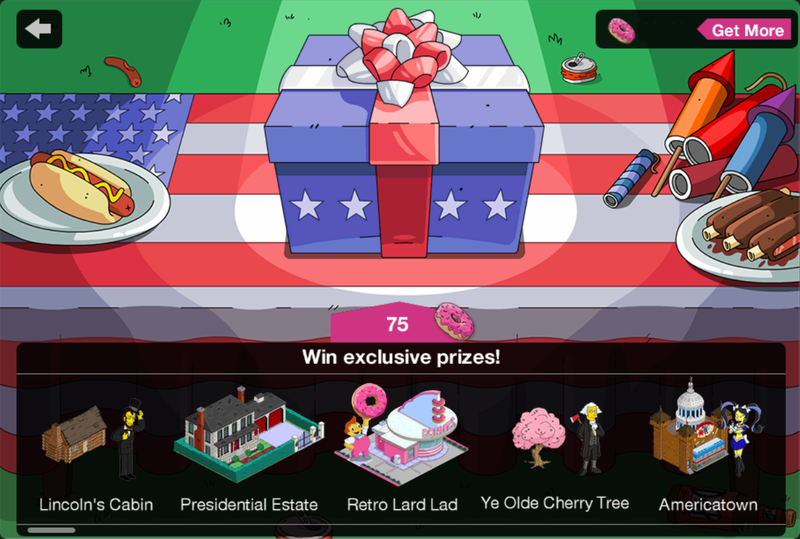 Presidential Estate Giving Guided Tours Possible 4th of July Mystery Box item. 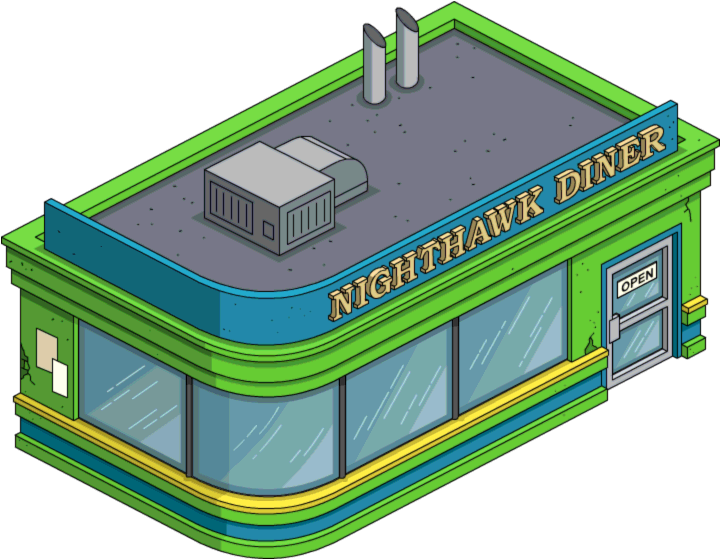 Nighthawk Diner 90 Giving Insomniacs a Place to Go Unlocks Rex Banner. 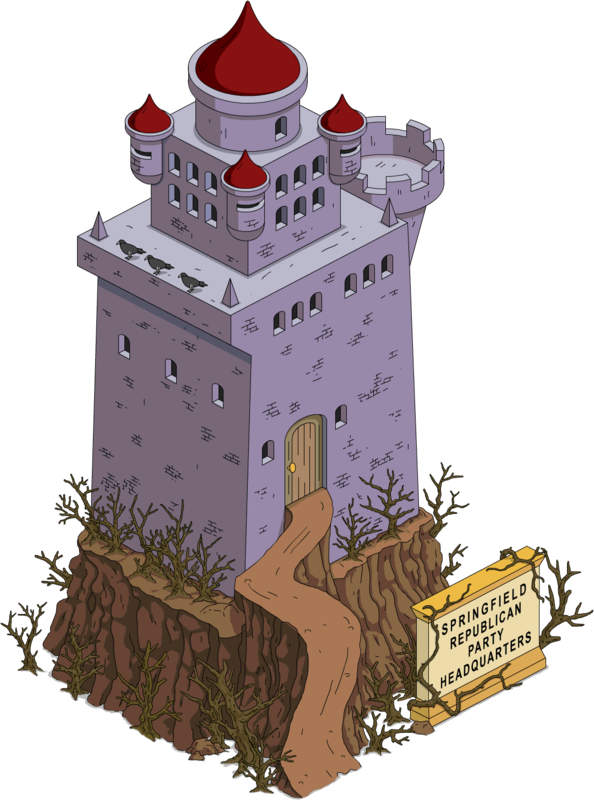 Republican Party HQ Engaging The One Percent Returns from Terwilligers. 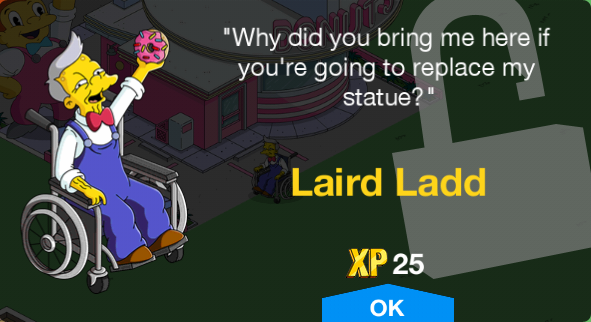 Retro Lard Lad 120 Breaking The Fourth Wall Unlocks Laird Ladd. 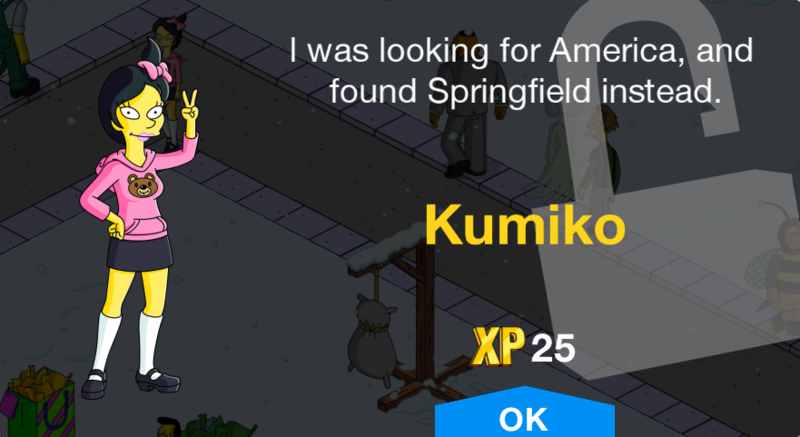 Americatown Serving Up the Authentic American Dream Unlocks with Americatown and Sailor Kumiko bundle. 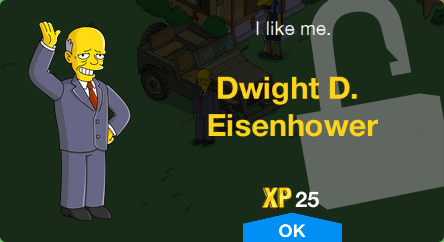 Eisenhower's 4x4 150 Unlocks Dwight D. Eisenhower. 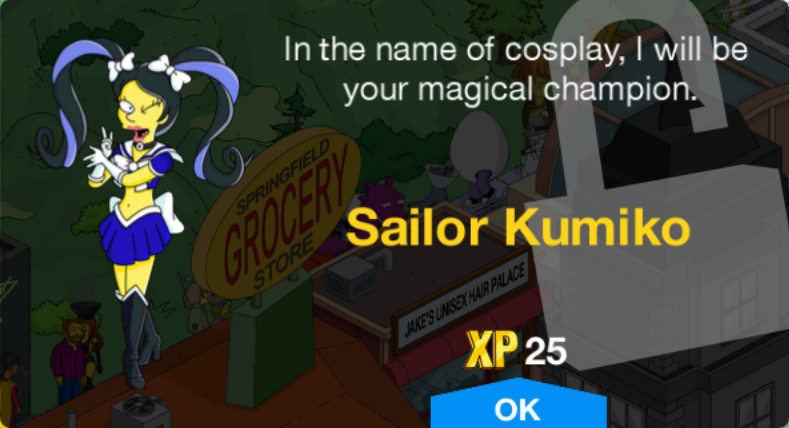 Rewards 1,395 for the Time Traveling Toaster event. 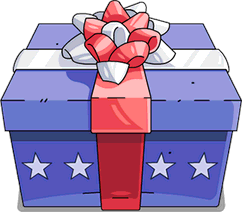 American Flag 5,600 Returns from 4th July 2013, July 4th 2014, 4th of July 2015, Tailgate and Daily Challenges System and 4th of July 2016. 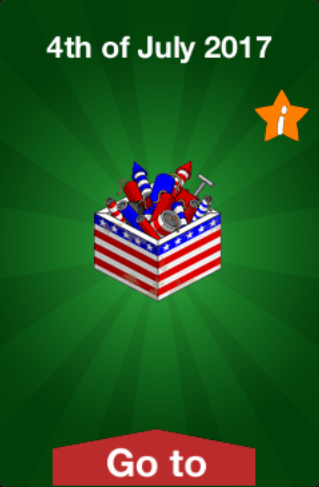 Patriotic Box of Fireworks Returns from 4th of July 2015 and 4th of July 2016. 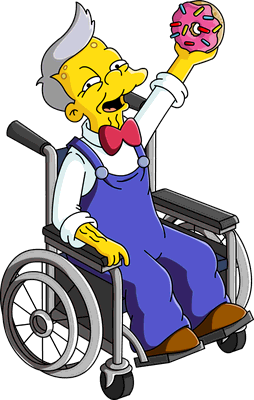 Liberty Bell 50,000 Returns from 4th July 2013, July 4th 2014, 4th of July 2015, "Much Apu About Something" and 4th of July 2016. 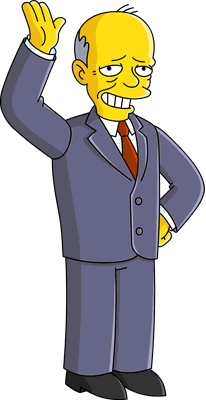 Lincoln Memorial 100,000 Returns from July 4th 2014, 4th of July 2015, "Much Apu About Something" and 4th of July 2016. 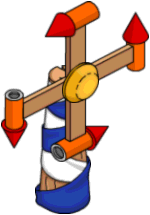 Pinwheel Firework 40 Returns from 4th July 2013, July 4th 2014, Winter 2014, 4th of July 2015, Crook and Ladder and 4th of July 2016. 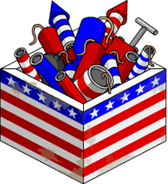 Box of Fireworks 60 Returns from 4th July 2013, July 4th 2014, Clash of Clones, Winter 2014, 4th of July 2015, Crook and Ladder and 4th of July 2016. 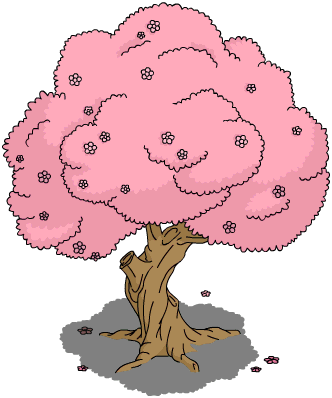 Ye Olde Cherry Tree Possible 4th of July Mystery Box item. 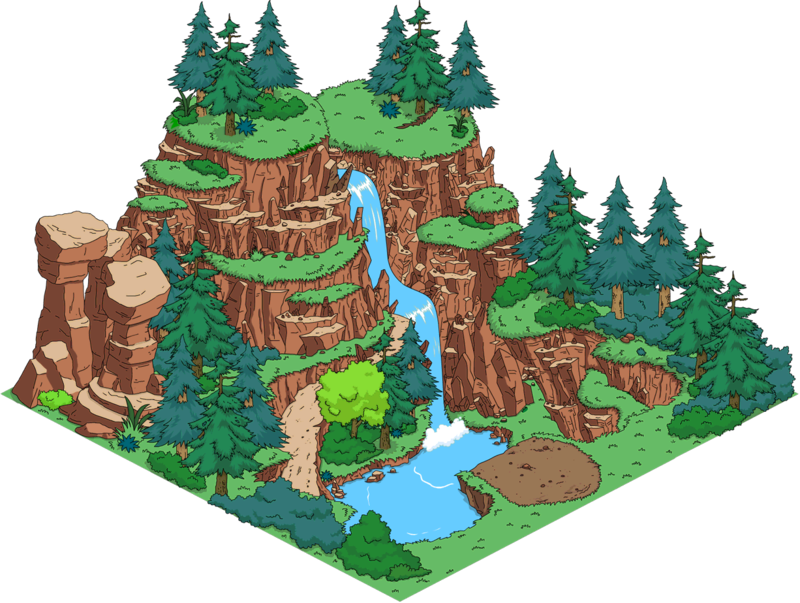 Springfield National Park Possible 4th of July Mystery Box item. 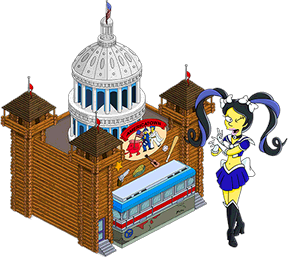 Lisa Statue of Liberty 75 Returns from 4th July 2013, July 4th 2014, 4th of July 2015, "Much Apu About Something" and 4th of July 2016. Fireworks Barge 80 Returns from July 4th 2014, Winter 2014, 4th of July 2015 and 4th of July 2016. 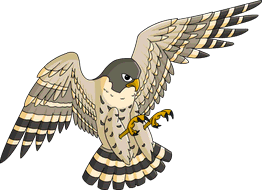 Modified on February 26, 2019, at 22:07.